BJG Manufacturing Solutions is one of the most well established manufacturing shop in the midwest with several NASA controlled CNCs, including a Moore G-48 with a capacity of 24x48". All of our CNC equipment is laser calibrated to ensure accuracy in the +/-.0001" range. Our finished products can also be inspected on our 2018 Zeiss CMM. Our customer base includes both large and small companies from around the country in industries such as aerospace, mold making, tool and die, medical and gage manufacturing. 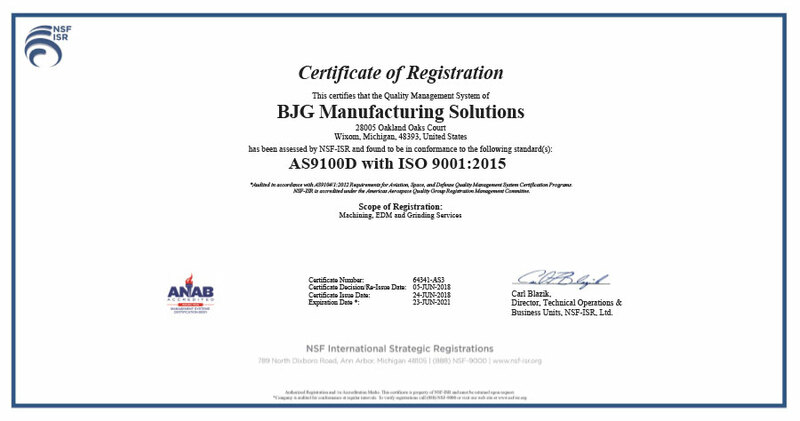 BJG Manufacturing Solutions has been in business since 1966. We are equipped and perpared to handle your job.